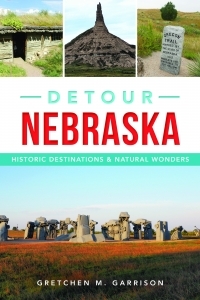 Detour Nebraska is written by Gretchen M. Garrison and has been published by the History Press. Available both in local Nebraska stores and on-line, you can find out more details at this link. To find out about the upcoming Detour Nebraska events, please click here. This page also contains author interviews and links to blog posts that have featured the book. This excerpt from the back cover that tells more about the title. For many, Nebraska is the flat prairie seen from the interstate. Yet with the Sandhills, bluffs and river valleys, the state has an abundance of riches. The heritage of early Nebraskans is evident. Fort Kearny and Chimney Rock were pioneer harbors. The Fur Trade Museum and The Homestead Monument of America tell of those who came to make a life. Carhenge is a nationally known treasure. The Joslyn Art Museum features world-class art, and the Nebraska National Forest is the largest hand-planted forest in the nation. Native Nebraskan Gretchen Garrison details the places and people that make the Cornhusker state unique. For more a behind-the-scenes look at the book, check out 31 Days Worth of Blog Posts Featuring Detour Nebraska.